Today during Martha's lunchtime nap I made a new cover for my deckchair. It was surprisingly easy to make and I used the old cover to get the correct size. 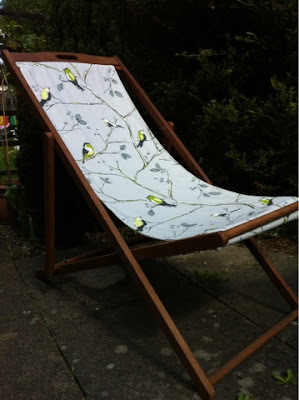 I purchased the lovely grey bird fabric (Berkeley Square -Lime) from CallyCo in Cambridge. Even though the fabric is upholstery weight fabric i wanted to give myself extra piece of mind that it would stand up to heavy and perhaps weighty use so i backed the fabric with a plain linen. Now i need to decide whether i should paint the frame? white? grey? any ideas? !